ALPINE, Texas -- A 14-year-old girl died of an apparent self-inflicted gunshot wound after shooting and injuring another female student Thursday inside a high school in West Texas, according to the local sheriff. Authorities haven't released a possible motive for the gunfire that erupted shortly before 9 a.m. at Alpine High School in Alpine, about 220 miles southeast of El Paso. The shooting was followed by a series of unrelated threats made by a male caller that added to the chaos of the day and diverted law enforcement from the high school. "That's ridiculous for someone to call in something like this when we've got this situation going on," Brewster County Sheriff Ronny Dodson told radio station KVLF. The sheriff said the family of the girl who died had moved to Alpine, a town of roughly 5,900 residents, about six months ago. She was a freshman at the school, he said, but he declined to provide other details. Dodson said the injured student ran outside seeking help and was taken to a hospital with injuries that weren't considered life threatening. A U.S. Homeland Security officer responding to the shooting also was injured; he was shot in the leg when a U.S. marshal accidentally discharged his weapon, Dodson said. Big Bend Regional Medical Center spokeswoman Ruth Hucke said the hospital treated two people from the incident. She said one was treated and released, while the other was transferred. Hucke didn't specify which patient was released, but officials said the injured officer was transferred to a hospital in Odessa. 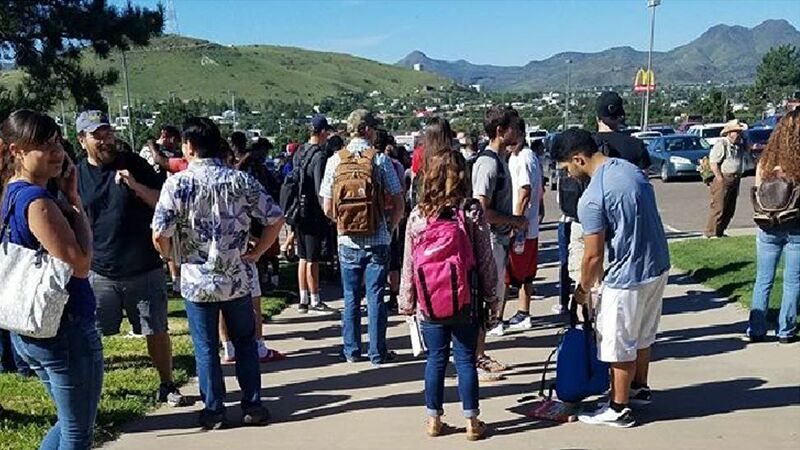 The shooting at the high school prompted a lockdown at Alpine's three public schools, which were later evacuated. Alpine police Chief Russell Scown said even after the shooter was found mortally wounded in a bathroom at the school, it wasn't immediately clear that she was the assailant. Emergency responders at one point thought two shooters may have been involved. The school district declined comment Thursday, saying it would release a statement later. Law enforcement officials were also dealing with threats made in the wake of the shooting. They said they don't believe there was a connection between the threats and the shooting at the high school. Authorities said threats were phoned in to an Alpine hospital and to Sul Ross State University, which is about a mile from the high school. Officers and bomb-sniffing dogs had to search for explosives in each building of the university, Dodson said. None were found. "Right now, we think we've got some nut, who in the midst of one of our most emotional times here at our school started calling in these threats," Dodson said at an afternoon news conference, adding, "Basically, he's what we're looking for right now." There was also a threatening note left at a motel in Marathon, Texas, about 30 miles east of Alpine.